He didn't make the cover, but he got a pretty neat illustration souvenir nonetheless. Governor John Kasich can thank Ohio's suburbs for his win in 2014. I'm not talking about last year's reelection win. 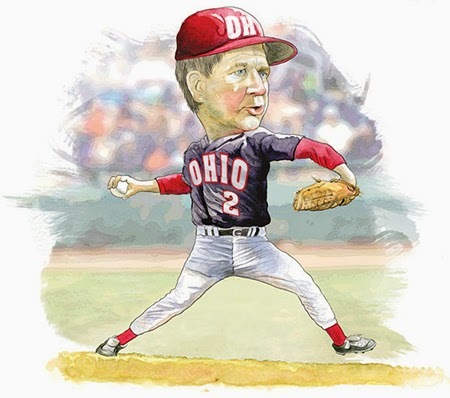 I'm talking about Ohio's #2 slot in the annual race to win the Governor's Cup from Site Selection magazine. The article A League of Their Own tells the 2014 story of economic development success around the country. Ohio has a pretty good story again this year too. As is my custom, I have analyzed the win. I'm boosting suburbs, with facts. Bottom line: Again this year in Ohio, it's a story about Ohio's suburbs boosting Ohio. Manufacturing continues to prove it is alive and thriving in Ohio. 52% of the projects on the Site Selection list were manufacturing projects. In fact, 62% of the 21 projects with $50 million or greater investments were big manufacturing projects. Clearly, the majority of Governor Kasich's economic development success is owed to Ohio manufacturing. Suburbs are where manufacturing goes with 95% of Ohio's manufacturing projects happening in Ohio's smaller cities and suburbs. Ohio's three C's (Cleveland, Columbus, and Cincinnati) combined for 15 manufacturing projects in 2014 out of 257 statewide. That means the other 242 came from Ohio's smaller cities, suburbs, and exurbs. Suburbs accounted for 74% of all of the projects that brought Ohio second place on the coveted list. That matches the high percentage for the last seven years of which the total has never dropped below two thirds. Licking County garnered 3 of the 21 largest capital investment projects in 2014, more than any other county. Licking County is a suburban county. Ohio's economy depends on the strength of its suburbs. I can't help but think back to my blog in 2012 to sum up why this matters. Density and bigness are not in the recipe for economic development success. Ohio's economic strength is in her suburbs. My research is not all that hard to do. One can quickly look at the 2015 version of the "Ohio Private Investment Survey" report by Ohio's DSA to glean the stats. At 95% for 2014, the manufacturing percentage for the suburbs and exurbs stat reconfirms a trend. It was 94%, 93%, and 94% in 2013, 2012, and 2011 respectively. Here's links to my 2013 and 2012 columns on this subject.